I love how Tableau encourages data conversations. Among their many inspired decisions, creating Tableau Public so that anyone can create and share data stories has got to be one of their best. Earlier this week, Nelson Davis wrote a blog post where he expanded upon a viz by Adam McCann that looked at life expectancy by country over the last 40 years. While Adam’s viz was well constructed, Nelson took things to the next level by altering one of the axes, so that a country’s rank was plotted over the 40 years along with its life expectancy. This created a wonderful bump chart that not only looks cool but invites exploration. 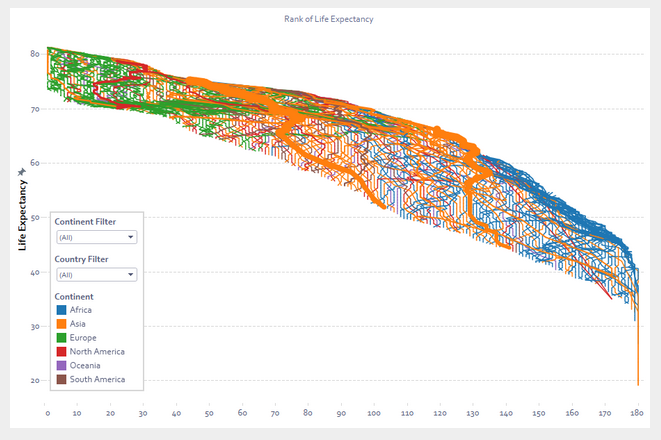 Nelson further enhanced his viz by highlighting specific countries with a marked change in life expectancy and using Tableau’s story points to explain why. The result is a deep, insightful and sobering story told with just a handful of data points. While exploring Nelson’s viz, I found myself wondering if there was a way to highlight those countries that have experienced the sharpest declines in life expectancy without the need to look for them individually. And although I think the bump chart looks really cool, my mind doesn’t immediately see the trend since the years are not plotted sequentially. So I created a traditional line chart with Year on the Column shelf, Life Expectancy on the Row shelf and Country on the Level of Detail. 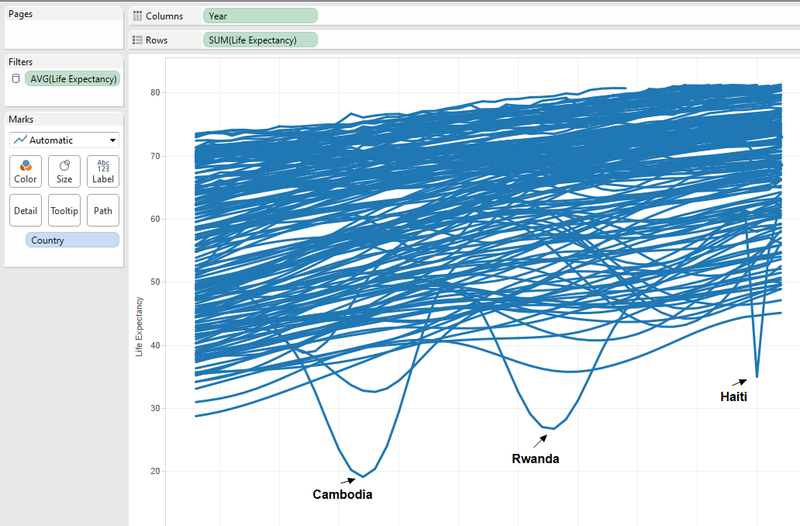 Three of the countries with the largest drops (Cambodia, Haiti and Rwanda) stood out very clearly, but the other countries that experienced significant drops were hidden inside of the blue spaghetti. How could I show those? This led to a series of sketches where I experimented with different calculations and formatting choices in an attempt to highlight the countries with the biggest drops in life expectancy sometime over the last 40 years. 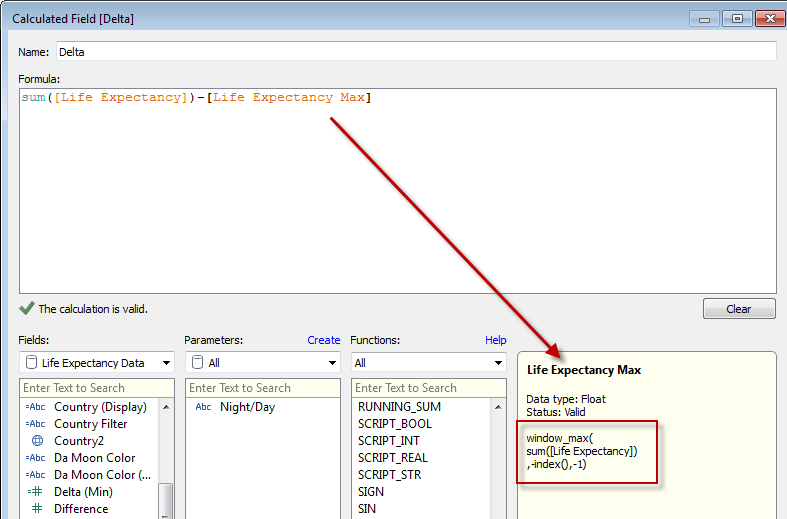 I finally decided on a calculation that looked at the delta between any individual year’s life expectancy value (by country) and the maximum life expectancy of the preceding years. This not only identified where the largest declines occurred, but by comparing each year to only the preceding years (vs. all of them) I avoided obscuring some dips due to that country’s overall improvement (and most countries have seen an overall improvement). Click the image below to open the viz.